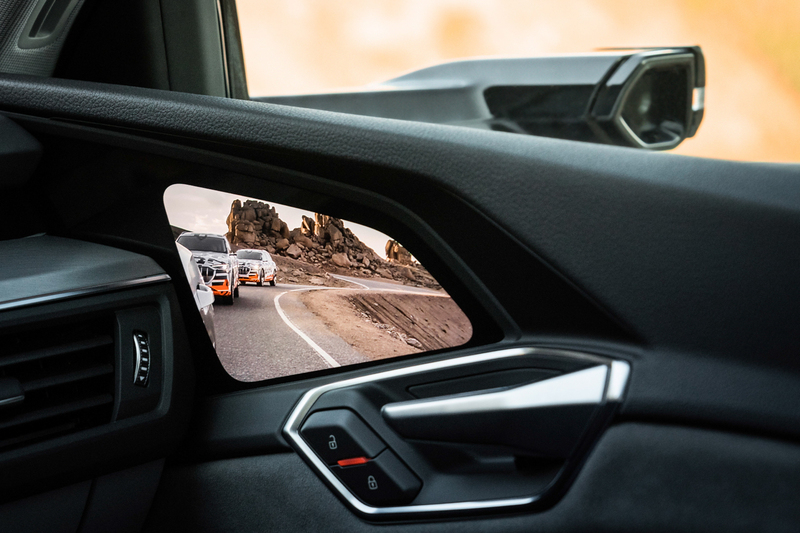 Audi made a big splash a few weeks back, showing off its new side camera technology for the upcoming e-tron, which essentially replaces side mirrors with high-definition cameras and displays what they see onto screens inside the car. It’s an odd tech that will take a long time for customers to get used to and it was a big deal when Audi released it. However, Lexus may have beaten Audi to the punch. On the new Lexus ES, customers can select “Digital Outer Mirrors”, which are essentially the same thing as Audi’s mirror cameras. They feature high-def cameras on little arms that stick out just below the A-pillars. They display what they see onto 5-inch screens that flank the windshield, on the inside of each A-pillar. This placement actually seems a bit easier to see than Audi’s, who places its screens on the door panels, close to the dashboard. However, Lexus’ literally seem like a couple of screens were just glued to the inside of the A-pillars. Aesthetically, it looks bad and they seem like they’re too in the way, when you’re not using them. This new Lexus ES will go on sale this October, undercutting the Audi e-tron’s on-sale date by about half a year in America. Those side cameras will be available at launch in October, while there’s no word on when the Audi e-tron’s side camera option will become available but we don’t expect it at launch. So the ES beat Audi to the camera punch. Admittedly, there’s an asterisk next to that victory, as new Lexus ES’ camera mirrors will only be available in Japan. We’ll see how this tech plays out, as it’s a very new, very radical idea and one that’s never been done before on a production car. Car designers and engineers love these side cameras, as they’re more aerodynamic, more stylish and can do more for the driver, as they can focus on specific areas when turn signals are on or when in reverse. But drivers are going to have a steep learning curve, we suspect. We’ll find out soon enough.